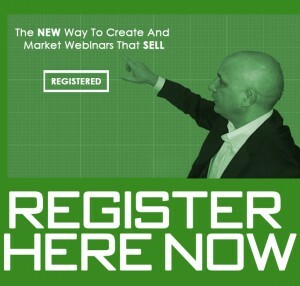 Discover How To Create and Promote Webinars That Sell! New: A unique system for getting almost free registrants (and maybe turning a profit before the actual webinar) ...from totally cold traffic! The Six-Step Webinar process I'm currently using to average over $19,000 in sales per webinar campaign. Hypnotic NLP language to use at the end of your webinar so you can easily transition into making your pitch (without feeling awkward). The 12-part closing process that I'm personally using so you can convert like crazy, all while building authority and goodwill. Please register now before all seats are taken! BE AWARE - THERE ARE NO REPLAYS!